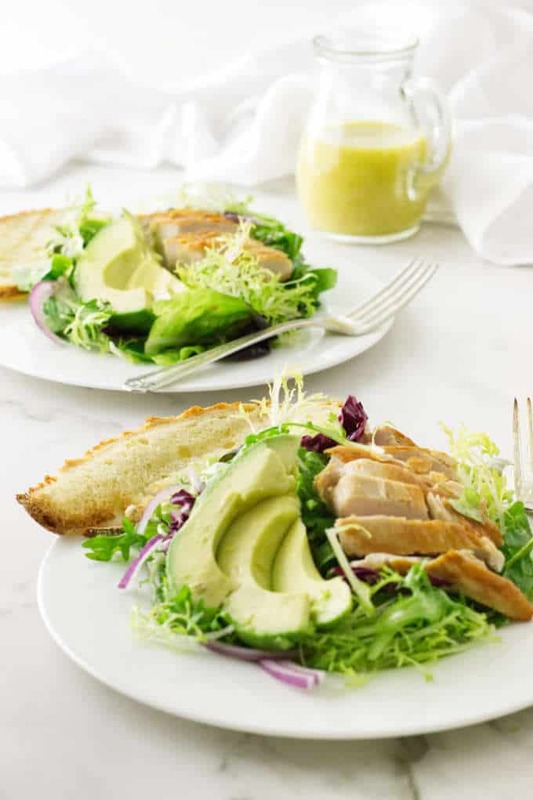 I love this green salad with avocado and chicken! It is a complete meal in one dish. Not only is this a delicious salad but it’s simply delightful to enjoy a green salad with the added protein and taste of the chicken. 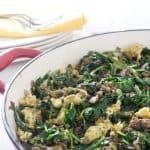 This is a healthy low carb meal and it can be made a keto friendly salad if you eliminate the honey. A crisp green salad is a great option for lunch. 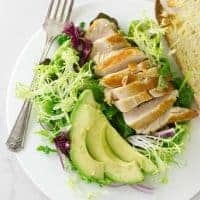 This green salad with avocado and chicken has enough protein and nutrition to boost your energy level until dinner time. 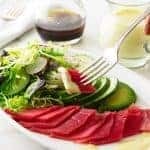 This healthy low carb salad has healthy fats from the avocado and all the carbs come from the vegetables and a splash of honey. If you are on a Ketogenic diet, eliminate the honey and you are set for a fabulous meal. A huge time saver is to keep several roasted chicken breast in the refrigerator for quick lunches of sandwiches, pastas or salads. Rotisserie chicken also works well for this salad. A Costco rotisserie chicken is very budget-friendly. Remove the meat from the carcass and keep in a covered container in the refrigerator 3-4 days. Repurpose the chicken carcass for soup or chicken bone broth. 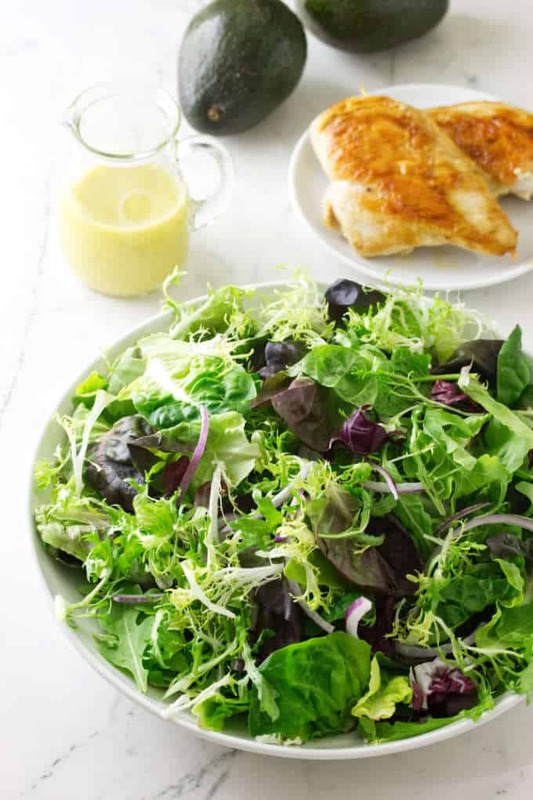 Cut the chicken into bite-size pieces or thin slices and add to the salad bowl. You can prepare the salad up to this point and refrigerate it until ready to serve. Do not add the avocado until ready to serve the salad. As soon as an avocado is cut it begins to oxidize and turn dark. The acid in lemon juice will stave off the process a bit but eventually, it will turn dark. When choosing a ripe avocado, select one with a darker skin, place it in the palm of your hand and gently squeeze with only the hand and not the fingers. If it is ripe you will feel a slight give or a softness to the avocado. It is ready to eat. If the avocado has dark skin, indentations and feels soft and mushy, it is over-ripe. Do not buy that one. This basic salad dressing is one of our main-stays. It is so simple to put together and the addition of a little honey balance the flavors without giving it an overly sweet flavor. Honey is a healthy sweetener that if you’re on a ketogenic diet you will want to eliminate the honey. First add the lemon juice, Dijon mustard, grated garlic and olive oil to a Mason jar. Shake the jar for 30-seconds to combine, taste and add salt and pepper. Pour enough dressing on the salad to lightly coat the greens. Toss the salad and serve. Another option for serving this salad is on individual salad plates. Portion the salad mixture onto salad plates, then add equal portions of chicken and avocado to each plate. Serve the dressing on the side so each guest can add what they want. We have a couple of family members that are on a ketogenic diet plan. They are eating a diet that is very high in healthy fats and extremely low in carbohydrates. In order to make this salad work for our keto diet friends, we eliminate the honey from the salad dressing. That turns this into a meal that can be enjoyed by everyone in the household. 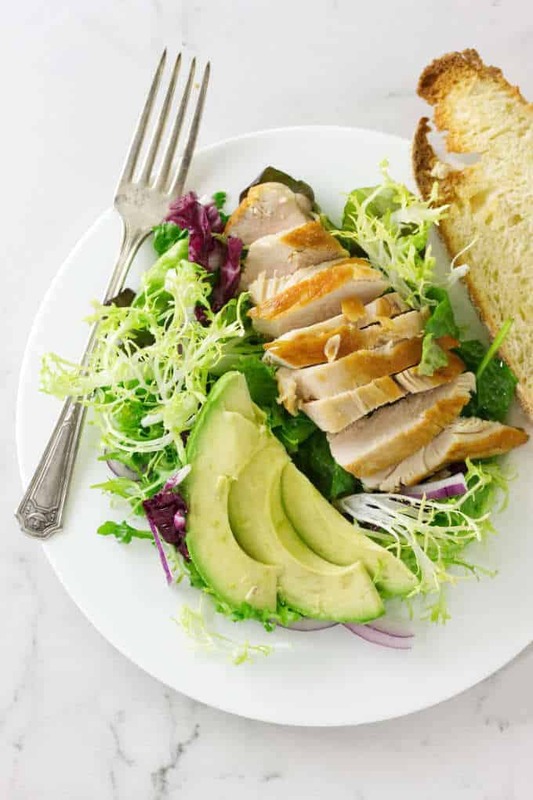 This simple Green Salad with Avocado and Chicken is the perfect lunch or light dinner. A tangy, slightly sweet vinaigrette perfectly compliments the salad. If you are on a ketogenic diet, eliminate the honey and the only carbs will come from healthy vegetables. 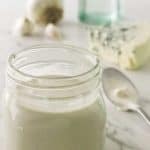 Add all the ingredients into a small lidded jar and shake well to blend. Slice the chicken into bite size pieces and set aside. Cut the avocado in half, remove the seed and slice. Set aside. In a large salad bowl, add the mixed greens and onion slices. Pour about 1/2 of the dressing on the greens and toss well. 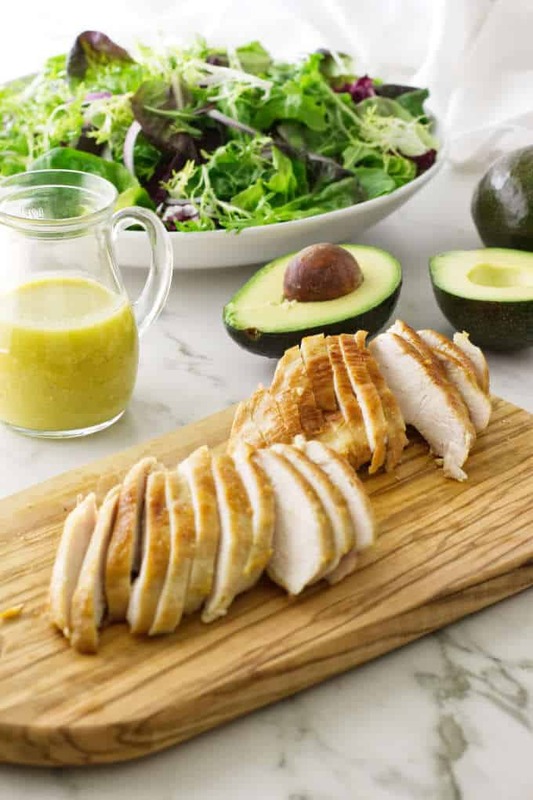 Divide the greens equally between four salad plates and top each salad with 1/4 of the chicken and 1/4 of the avocado slices. Transfer the salad dressing to a small pitcher and allow each guest to add a portion to their salad. The small amount of honey balances the tartness of the lemon juice without making the dressing overly sweet. If you are on a ketogenic diet then eliminate the honey from the salad dressing. Choose your favorite salad mix. A bag of pre-washed salad greens will weigh about 5 to 7 ounces. To quickly grill chicken breasts, heat a saute pan over medium heat. Season the chicken with salt. Oil the pan, then place the chicken in the pan. Cook for 8 to 9 minutes on one side then flip it and cook for another 5 to 6 minutes. Rotisserie chicken works well for this salad.